• Great for light weight fabrics such as rayon and linen. Use the Economy Plastic Skirt and Pant Hangers in Clear for an affordable alternative. 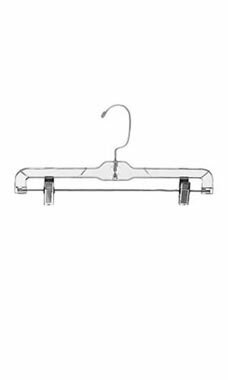 These regular hangers have the same great design, shape, and dimensions of our premium hangers at a more affordable price! Featuring anchored chrome swivel hooks, hang bars, and padded metal clips, these hangers are a great addition to your retail displays. The 14" regular skirt and pant hanger will hold up to 6lbs which makes them perfect for lightweight clothing and everyday use. Sold in cases of 100.